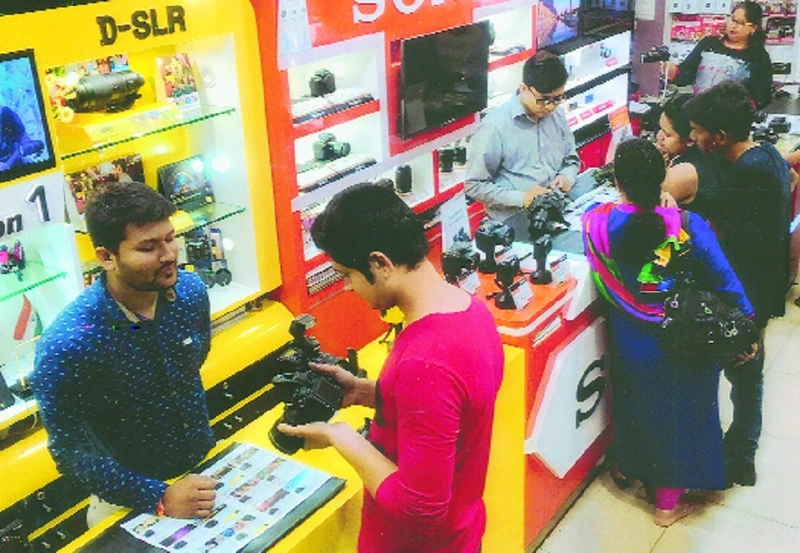 ALTAF H Vali, is showcasing complete range of DSLR cameras from Nikon, Canon, Fujifilm and Sony. Consumers, both professional and amateurs get to touch, feel and experience the DSLR cameras with combination of lenses and other accessories providing expert guidance, technical know how all under one roof. Sony’s latest launch the ILCE-6400 mirror less interchange able lens camera is on display. The camera boasts of 24.2 megapixal Bionz-X AP-C CMOS sensor with a focusing time of 0.02 seconds, making it the world’s fastest auto focusing camera letting the user achieve the perfect shot in any situation with stunning precision. It also records video in 4K HDR and has a touch screen for easy operation. It comes in two variants ILCE-6400L with 16-50mm lens priced at Rs 85,990 and ILCE-6400M with 18-135mm lens priced at Rs 1,09,990. Nikon’s latest slim and stylish mirror less camera with ultimate video quality, all new Z6 is on display. It has a 24.5 megapixel full frame sensor with a capacity of record 12 frames per second and 4K video quality. Canon’s new models of 2019, EOS-RP and EOS-M50 mirrorless cameras are available on demo. The store also houses complete range of original accessories. Altaf H Vali is located near Variety Square, Sitabuldi (Ph: 0712-2522841, 2562038).